Nutella isn't something I grew up with at home. Both of my weirdo parents had an aversion to it. I've even heard my Italian father refer to it as "disgusting." I am still to this day fairly certain that he's never even tasted it. Either that, or he's kind of a monster, because this stuff is delicious. The first time I smothered this chocolate and hazelnut spread onto a crêpe I fell in love, and it's been hot and heavy ever since. I remember buying a jar and stashing it in my college dorm room. It was a symbol of my independence. I could make Nutella a part of my new life as an adult, and everything felt right and good and tasty. Unfortunately, along the way, my tummy decided to get real grumpy about dairy. This did not bode well for me and my affection for this glorious chocolate spread. 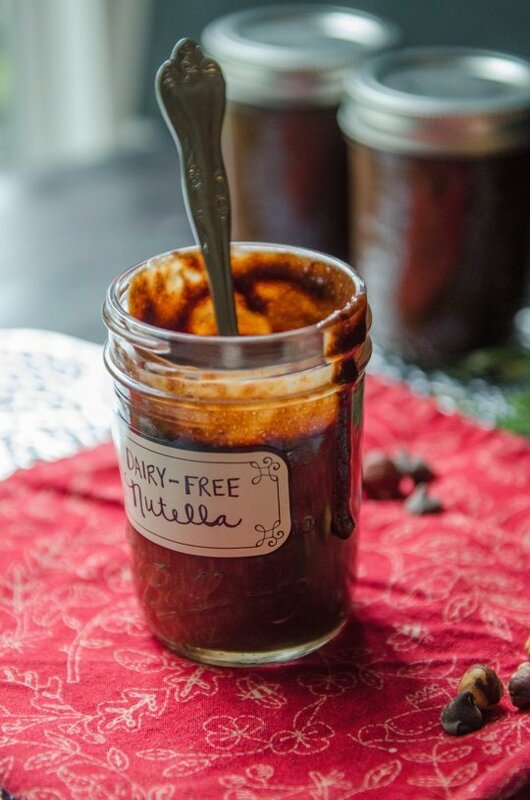 Instead of imagining a world without Nutella (sad face), I decided to recreate it with ingredients that made my belly as happy as my taste buds (dance party). A combination of coconut milk and dairy-free chocolate chips make a really great substitute for the creamy chocolate component of this spread. It has past the test of many a Nutella-lover, so much so that I started making batches around the holidays and packaging them up as gifts! 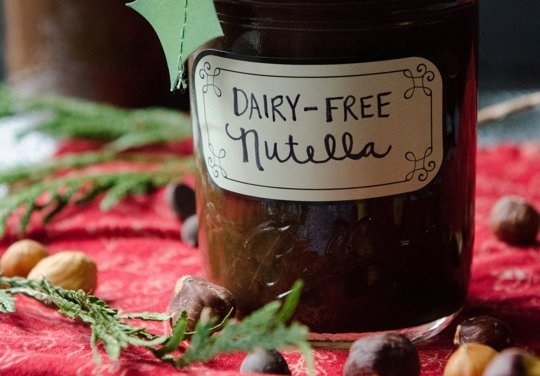 Do you have any dairy-sensitive former Nutella monsters in your life? If so, you totally need to whip this recipe up and spread the love. Pun intended. Makes 2 pints of Nutella. Preheat the oven to 350°F. Line a baking sheet with foil and scatter the raw hazelnuts on top. Place in the oven to toast for 10 to 15 minutes, until very fragrant and starting to darken in color. Keep an eye on them so that they don't burn. Dampen a clean dishtowel and place the toasted hazelnuts in the center. Fold the damp towel over the hazelnuts, and rub back and forth until the skins release themselves from the hazelnuts. It may take a few minutes. Discard the skins. Transfer the hazelnuts to a food processor. Add the salt and process until the hazelnuts form a very fine meal. This might take a minute or two depending on the strength of your food processor. Combine the coconut milk and coconut sugar in a medium sauce pan over medium heat. Stir this mixture until the sugar has dissolved into the coconut milk. Allow to cool slightly. Add the coconut milk and sugar mixture to the ground hazelnuts in the food processor. Process until the mixture is creamy. This might take several minutes. Stop the food processor and scrape down the sides if necessary. Place the chocolate chips into a double boiler over low heat, or in a heat-safe bowl over a pan filled with an inch of simmering water. Melt the chocolate, stirring occasionally. Once they are completely melted, add the chocolate into the food processor with the other ingredients. 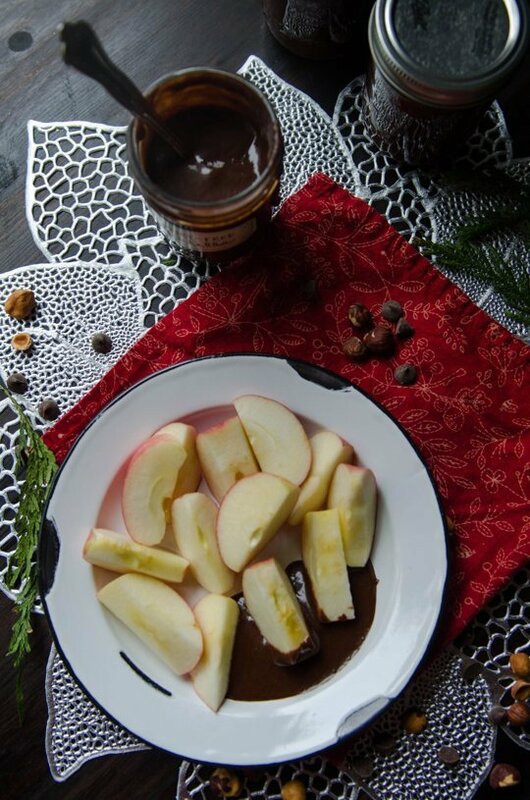 Process until the entire mixture is smooth and creamy and resembles Nutella. The mixture might be slightly thin, but it will thicken up as it cools and sets. Portion the Nutella out into mason jars and seal with lids. Keep the jars refrigerated and consume within 2 to 3 weeks. Add labels and some decoration to make it the perfect holiday gift! This post was republished from thekitchn.com. You can find the original post here.